Today I narrowly escaped serious injury….well maybe not serious injury but I am thankful that I only have a bruise rather than a broken ankle. One of our young athletes slapshotted (that’s what I call it ) my ankle while I was on yard duty. (2) the pain was worth the laughter and fun I witnessed as I was sandwiched between two groups of boys. I watched (too closely) a group from grades six to eight play hockey and another group from mixed grades play basketball. There is something so neat about watching mixed ages play together – there seems to be less competitiveness and a lot more laughter due to the acceptance of different skill levels. I feel that the risk the school takes letting boys play hockey at recess is rewarded with laughter and humour. I guess I will continue to watch closely (though not as closely) so as to try and avoid the pain and hurt. Posted in Uncategorized and tagged hockey, recess, risk. Bookmark the permalink. 3. It is an anchor chart. 4. It reminds ME of things we’ve done so I can point out connections and do regular review. I maybe use this bulletin board too much. I keep adding things. Every time I find something cool I want to add it. Fibinocci is pictured on the left – my students can’t believe someone would spend all his time thinking about math! Posted in Math, Reading and tagged anchor charts, bulletin boards, Math. Bookmark the permalink. Okay. I think I outdid (is that a word?) myself. I thought of a mneumonic for the provinces from left to right with not just the first letter of each province but (insert drum roll here), the first two letters of each province! I am geographically challenged so these types of things are handy for me. Bring all sad matters onto Quebec. You’ll have to figure out the provinces yourself. I’m sure you can do it now! Posted in Uncategorized and tagged Canada, provinces. Bookmark the permalink. If you have not structured your classroom to be able to work with small groups, you’re not meeting all your kiddos at their level. Whole group instruction addresses the needs of only about 1/3 of your students. The author was talking about math instruction and I would add reading. I agree with the quote, although I did not always practice this. I have observed whole group instruction where some of the kids figured they already knew the info so they tuned out, some of the kids really needed to listen but things went too quickly and they didn’t understand so they got distracted. I’m not saying whole group instruction can’t work, the challenge is to find ways to keep your audience engaged, and then when it comes to practice and reinforcement time, find ways to meet the needs of students at different levels (and we’re back to working with small groups). Posted in Math, Reading and tagged group work, instruction, whole group. Bookmark the permalink. I was waiting in a waiting room when I picked up a Macleans magazine and read the article Why Sitting is a Dangerous Health Threat. The article talks about changing our workplace culture to include and even expect walking and standing breaks. We ALL need these breaks! What a great challenge – not only to get our kids and students moving more but also to get up off our seats and really get involved! Posted in Classroom, Kids and tagged movement, sitting, standing. Bookmark the permalink. I often hear, “I don’t know what to write.” This is my attempt at a visual to direct descriptive writing. (Don’t judge – this was a quick pic I put on the white board.) Students were given small pictures of different aliens and then asked to write a description. This lesson worked well – the visual gave a direction and the fact that they were describing a fictional character meant the description could not be judged as wrong. 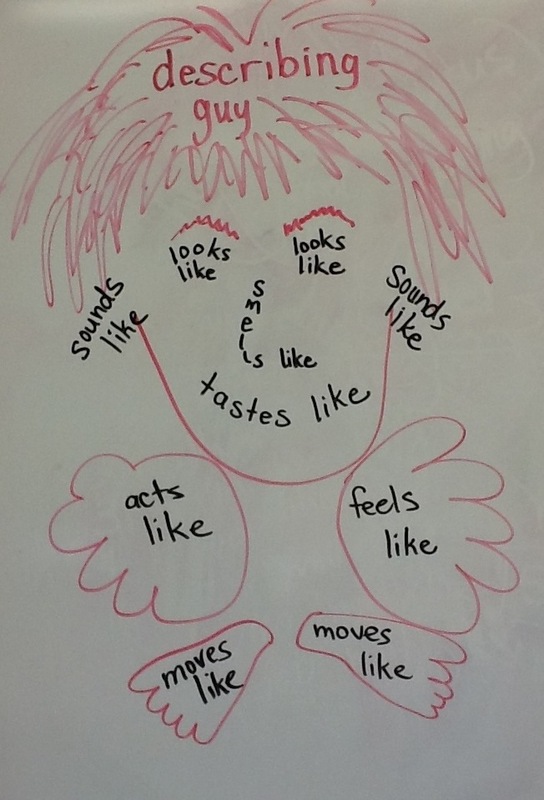 Posted in Uncategorized and tagged Description, graphic organizer, Writing. Bookmark the permalink. I had another thought about my last post…. Mainstreaming is managing, while inclusion is investing. Investing is more work, and does not always give the return we hoped for, but it is worth the time. If we stick with it for the long haul, and take some risks, we will see gains. Posted in Uncategorized and tagged inclusion, mainstreaming. Bookmark the permalink.